RT - The Saudi-led coalition has accused Houthi rebels in Yemen of using children as human shields, saying their airstrikes in Saada constituted ‘legitimate action.’ The Red Cross has called for protection of civilians during conflict. The International Committee of the Red Cross, citing local officials, announced that a total of 50 people died in the attack and 77 were injured, most of whom were children. 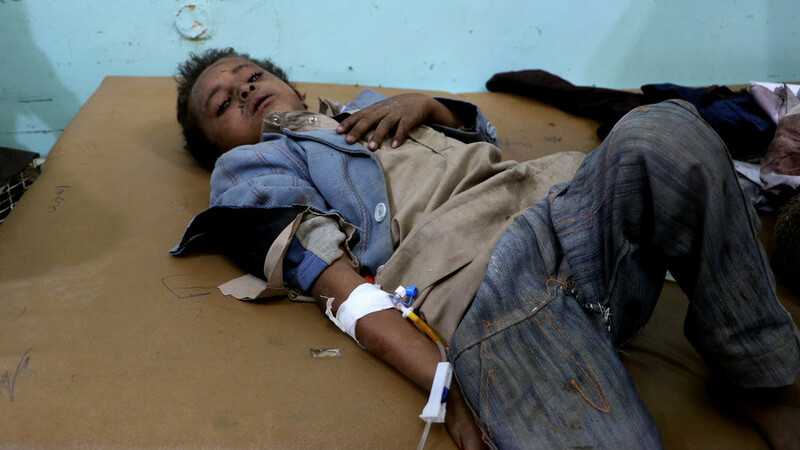 Very concerned with the initial reports of children being killed in Amran and Saada in #Yemen. Teams are verifying numbers of killed and injured. Children are NOT a target! I am watching with horror the images and videos coming from Saada in #Yemen and I have no words. How was this a military target? Why are children being killed? The UN children's agency UNICEF said it was "very concerned with the initial reports of children being killed" with UNICEF's resident representative in Yemen, Meritxell Relano saying that he is witnessing the “horror the images and videos coming from Saada… Why are children being killed?" The Saada attack took place less than a week after an airstrike launched by the Saudi-led coalition killed dozens near a hospital in the city of Hodeidah. Mirella Hodeib from the ICRC told RT that the group is calling for the protection of civilian infrastructure. According to the ICRC representative, humanitarian organizations can neither feed millions of Yemenis, nor provide access to healthcare for them. “Twenty million Yemeni people are in need of [humanitarian] aid. The ICRC has always called upon all parties of the conflict to [find] a political solution… in order to curb worsening humanitarian conditions,” she added. The Saudi-led coalition has been waging a brutal military campaign in Yemen since March 2015, in an attempt to restore president Hadi to power. Three years of Saudi-led bombardment and a blockade of Yemen has led to a catastrophic situation in the country, with 22 million people, or 80 percent of the population, in need of humanitarian aid, while more than half of the country is left without basic medical services. Human rights organisations have been accusing the coalition of indiscriminate shelling of civilians and infrastructure. The war in Yemen has killed almost 10,000 people in three years, and is what the United Nations has labelled as the world's worst humanitarian crisis. CANADA: Trump insults Canadians "off the record"